Do you love getting into the outdoors, cooking on an open fire and sleeping under the stars? If you’d asked me that very question just a few years ago I would have answered firmly in the negative; as I didn’t understand just how amazing a camping break can be. These days my feelings about camping are very, very different. As I explain in this camping checklist post, I really didn’t get the attraction of camping until I moved overseas, to a country which really knows how to DO camping properly: Canada. Having spent almost 4 years living in British Columbia, the Canadian province which is world famous for its iconic scenery, vast mountain ranges, endless hiking and clear blue lakes, I discovered how magical it is to go to sleep and wake up again surrounded entirely by nature. In this weekend shortcut post I show you how to enjoy a truly Canadian-style camping experience in Sussex, on England’s south coast. Since moving back to the UK I’ve been excited to indulge my love of the outdoor life and have been on the lookout for the perfect time and place to try out my newfound camping skills in my home country. As much as I loved living in BC I’m a patriotic Brit, and I am convinced that even though it’s on a smaller scale, the UK has plenty of beautiful scenery of its own, well worth experiencing from your tent. 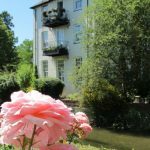 We are tremendously lucky in the UK to have an incredibly wide range of different types of landscape all within a pretty short distance – from mountains and beaches to canals and farmland. In my book, the way the Canadians camp is the only way to do it: most Canadian campsites are buried deep in woodland, or located a few hours’ drive down remote logging roads, or perhaps perched lakeside in national parkland, meaning that there are little or no facilities, and that includes electricity and phone service, and you pack in and pack out everything you need for the trip. If that all sounds like a lovely way to spend a weekend but you’re based in the South-East of England then this post might inspire you. Here’s how to soak up a few blissful days of utter relaxation at an off-grid campsite in East Sussex. All setup and ready for some camping fun! First off there are obviously no shortage of campsites in Sussex, and indeed in the UK – but when researching places to go for Canadian-style camping I noticed that most fit the stereotype of English camping I had prior to moving to Canada. The idea of pitching a tent in a shared field within earshot of busy roads, or at a campsite with rows of toilet blocks and showers and all the mod cons, like electricity and internet access, completely defeats the object of camping for me. A camping trip should be about being cut off from civilisation – and should definitely include a digital detox. So I was happy to find Eco Camp UK and its Beech Estate campsite in Sussex, near the pretty town of Battle. It offers what we in England call ‘eco camping’ but what I think of as simply ‘camping’ – in other words the entire site is set amongst woodland, has no electricity, no hook ups for camper vans, and boasts no phone signal or internet once you’re past the turn off to the entrance. This way for no phone signal! Beech Estate offers an opportunity to get back to nature, and while there are kids running around building forts and playing with sticks this definitely doesn’t feel like a holiday camp. The other major plus for those seeking genuine tranquility from their camping trip is that no cars are allowed into the site beyond the car park – you transport all of your stuff to your pitch using multi coloured wheelbarrows. This is way more eco friendly than a car! Also there’s no electronic or amplified music allowed, which undoubtedly keeps any would-be loud partiers from spoiling the tranquility. Just like all my favourite campsites in Canada you’re allocated a specific pitch, rather than just choosing a spot somewhere on a shared field (though a few of the pitches do take multiple tents). This is hugely preferable as it means more seclusion and privacy and zero chance that someone else will come along and pitch their tent too close to you. One major difference I found between camping in North America and the UK is the proliferation of glamping options. The sheer quantity of glamping and other posh camping on offer for British campers is immense. Sleeping in teepees, bell tents, shepherd’s huts and gypsy caravans is incredibly popular in the British Isles, which is great for people who don’t have all their own camping equipment and want to try out a natural style of break. By contrast I’d say that glamping is very much the exception rather than the rule in Canada. The only place I stumbled on for glamping breaks in BC were the yurts at Merridale cidery (if you know any other please let me know!) and it does make me wonder what it says about us Brits? That we like our camping to be chic, I guess. Beech Estate does have some pre-erected bell tents on offer for those who want to go camping in Sussex in style; you rock up and have a ready made luxurious tent already set up. They’re mixed in with the standard sites and so it doesn’t ruin the more rustic vibe of the campsite for everyone else. If you prefer to bring your own tent with you, which to me is a huge part of the fun, and you fancy all of the pluses of the Canadian style of camping I’ve described but want to do your camping in Sussex instead, I’d say Beech Estate is a great bet, especially if you’re based in London or the South-East (as I am) and don’t want a long journey to reach seclusion. I love this Rydal 500 Tent – well it does have 2 bedrooms! The Beech Estate site may have a few bell tents (and the company run a bell tent only site called Wild Boar Wood too) but I brought my own selection of new camping gear including a roomy Rydal 500 5-man tent. I also brought virtually everything from my usual camping packing list – including folding chairs and tables – so I happily booked one of their tent pitches which comes with nothing apart from a basic fire pit. The Eco Camp tent pitches are split into a couple of different categories – meadow pitches, forest pitches and a mysterious category described as ‘far away pitches’. I knew this was the one for me. The faraway pitches are basically set deeper in the 600-acre Beech Estate campsite towards the back end of the area set aside for campers – perfect apart from the fact that it’s a bit further to wheel all your stuff, but worth the trade off. My pitch was F1 but I overheard the very friendly warden tell some other guests that F3 is the most choice spot. There’s also a ‘valley view’ site which undoubtedly has the best view, but it is directly behind the reception area and the entrance so you have to balance your desire for seclusion with the pretty viewpoint. F1 didn’t live up to its name: it wasn’t noisy, fast-paced or car-friendly, and there were definitely no spectators. Next to my site of F1 I spotted another site numbered P16 – this is very slightly raised up and unlike many of the other spots had its own picnic table at the time of my visit. I never stayed at a campsite in Canada which didn’t have a picnic table so I wished it had been made clear which pitches had picnic tables, but it mattered not as I brought my own incredibly luxurious folding table which comes with 2 bench seats and 2 stools, so there was plenty of space to prepare food. I’m glad I brought my folding dining table (and my Pimms). I’d be happy to reserve P16 next time I come to Beech Estate if the faraway pitches are all booked up – and I’d book F1 again in a heartbeat. 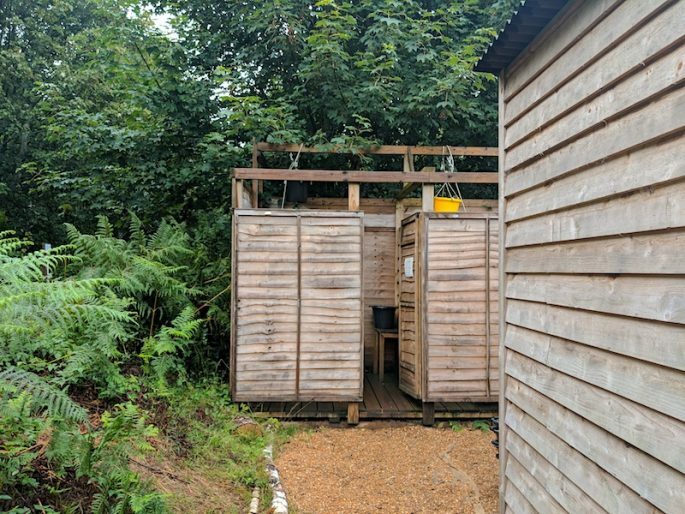 Having learned to love camping at campsites with no running water of any kind, and certainly no flushing toilets I was happy to camp in East Sussex in a place which offers alfresco bucket showers and eco-friendly composting toilets. If that sounds a bit scary to you fear not as the bucket shower is a lovely experience among the trees, and it does NOT involve tipping a bucket of tepid water over your head as you might imaging because the campsite has hot water – which does feel like cheating to me. The buckets have shower heads attached to them so you have what is essentially a normal shower, just outdoors, and you just get a little workout into the bargain. On my visit, so during the peak of the school holidays, I always found the showers empty and clean. Similarly there are composting toilets but for those of faint heart there is a single small block of flushing toilets by reception. The location of this campsite is a really nice blend of secluded and conveniently located. There are 2 pubs within a 45 minute walk of the campsite, and you can drive to the beach resort of Hastings in around 20 minutes or continue onto other seaside towns like Brighton, Bognor Regis or Rye. The south coast is full of stunning scenery and the High Weald Area of Outstanding Natural Beauty where the site is located is perfect if you want to experience the outdoors. The campsite is around 1 hour 45 minutes drive from Central London towards the arty south coastal town of Hastings. Prices for tent camping are £18 per adult per night, £20 per person per night for the valley view site. The campsite provides dispensers of washing up liquid, soap and shampoo, and has firewood for sale at £6 per bag (and there’s an honesty box if you need to buy more after hours), as well as grills for hire at £4. You are expected to pack in and pack out all your belongings including rubbish, but you can leave recycling on site.